Shake with ice and strain into a large glass filled with crushed ice. Float a barspoon of Lustau Almacenistas Oloroso Sherry, and garnish with a mint sprig, an orange twist, and a cherry. Two Fridays ago, I arrived in South Boston a little early for the American Craft Beer Fest, so I decided to visit Drink to elegantly pass the time. When I found a seat at bartender Will Thompson's section, I mentioned that I was going to the beer fest and that I wanted something on the lighter side. 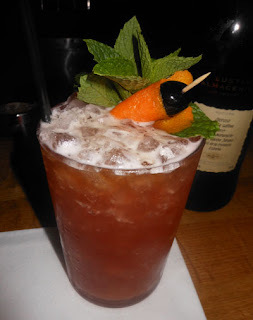 Since he did not have any recent original creations fitting that description in mind, we began discussing sherry drinks for Will had read my post on the Sherry Mai Tai. I wondered what other Tiki drinks could be sherryfied, and we began bouncing ideas back and forth until the concept of making a Sherry Jungle Bird came up. Since sherry and Campari (or Gran Classico) work really well together such as in John Mayer's 2011, it seemed like a splendid direction and I gave Will the go ahead to execute the drink as he thought would work the best. Will dropped the pineapple juice from 4 ounces to 2 1/2 akin to how Drink normally makes their Jungle Bird. For a sherry in place of the dark rum, he opted for a palo cortado which has the richness of an oloroso and the crispness of an amontillado; he also floated an aged oloroso sherry in place of whatever rum that Drink floats on top of their version of the classic. Once mixed, the Sherry Jungle Bird's mint and orange twist garnishes contributed greatly to the nose. A lime and fruity sip led into a nutty, soft Campari, and pineapple swallow. Indeed, the nutty richness of the sherry held the drink together just as well as a dark aged rum would. Hi I have been really enjoying your posts of late but this is my first comment. Quick question for you, what is your recommendation for pineapple juice (store bought or juicing a fresh pineapple or some other method altogether)? Fresh juice is always best, but I just buy it so I always have it on hand. Only know of a few places that juice it themselves. Great, thanks so much. Super helpful.